Did you know that much of the best sandstone that graces Calgary’s historic buildings and schools came from a quarry along the lower Elbow River valley owed by a Calgary pioneer? 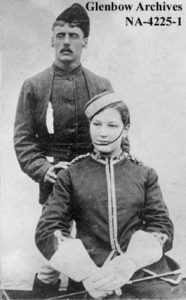 Joseph Butlin, one of the first recruits of the North West Mounted Police, served with Sam Steele’s scouts in the 1885 NW Riel Rebellion. In 1880, he homesteaded with his French-Cree wife, Angelique, on the banks of the lower Elbow River. There the couple farmed, ranched and raised 10 children. His neighbour to the south was Sam Livingstone. In the late 1880’s he purchased land and built a house where the Devonish Apartment building now stands (17th Avenue and 8th St. S.W.). Butlin opened the first slaughter house for Pat Burns in Calgary and later, operations in Wetaskiwin and Pincher Creek. He died in 1924 at age 76. 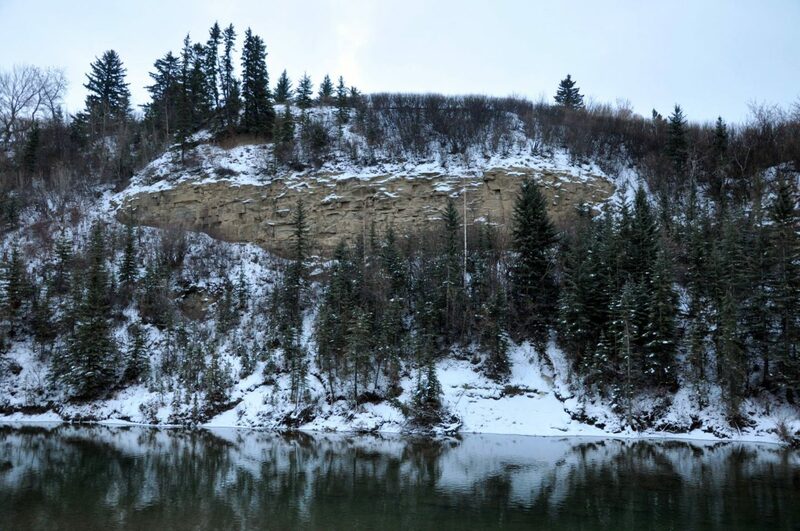 Joe Butlin’s land included the bank of the Elbow River opposite Riveredge Park where he established one of Calgary’s earliest sandstone quarries. The 1885 Burns and Elliott directory advertised an outcropping of “splendid freestone about six feet in depth” which was “pronounced [by industry] to be of the very best quality” and “a real bonanza”. The stone was transported either on the frozen Elbow River or by mule to the railway tracks. It was used for the Bank of Montreal building, Beaulieu (Loughheed House) and the original St. Mary’s Cathedral. In 1891 the quarry was acquired by quarry operator J.G. McCallum. The remains of the old quarry cuts on the steep escarpment below the Calgary Golf and Country Club are clearly visible when floating down the Elbow, from the south end of the Britannia Escarpment and from Riveredge Park. Located immediately south of Sandy Beach along the Elbow River, the 9 hectare Riveredge Park may have been part of Butlin’s homestead. This land was acquired by Eric Harvie in 1955 and then donated to the City along with River Park to establish “a park for rest and relaxation in a natural setting”. Riveredge Park was designated a Municipal Historic Resource in 2014. Today the YMCA operates Camp Riveredge and the Between Friends Club, a local non-profit organization, provides programs for people with disabilities. Sources: The City of Calgary, Schedule “B” to the Bylaw (#32M2014) to Designate Riveredge as a Municipal Historic Resource, www.pioneersalberta.org, Marilyn Williams (Conservation Studies Heritage Management Consultant), and the City of Calgary, Parks.